Objectives This study aimed to assess the biological impact of occupational exposure to diesel exhaust (DE) including DE particles (DEP) from heavy-duty diesel-powered equipment in Norwegian tunnel finishing workers (TFW). Methods TFW (n=69) and referents (n=69) were investigated for bulky DNA adducts (by 32P-postlabelling) and expression of microRNAs (miRNAs) (by small RNA sequencing) in peripheral blood mononuclear cells (PBMC), as well as circulating free arachidonic acid (AA) and eicosanoid profiles in plasma (by liquid chromatography–tandem mass spectrometry). Results PBMC from TFW showed significantly higher levels of DNA adducts compared with referents. Levels of DNA adducts were also related to smoking habits. Seventeen miRNAs were significantly deregulated in TFW. Several of these miRNAs are related to carcinogenesis, apoptosis and antioxidant effects. Analysis of putative miRNA-gene targets revealed deregulation of pathways associated with cancer, alterations in lipid molecules, steroid biosynthesis and cell cycle. Plasma profiles showed higher levels of free AA and 15-hydroxyeicosatetraenoic acid, and lower levels of prostaglandin D2 and 9-hydroxyoctadecadienoic acid in TFW compared with referents. Conclusion Occupational exposure to DE/DEP is associated with biological alterations in TFW potentially affecting lung homoeostasis, carcinogenesis, inflammation status and the cardiovascular system. Of particular importance is the finding that tunnel finishing work is associated with an increased level of DNA adducts formation in PBMC. Exposure to diesel exhaust (DE) including DE particles (DEP) is carcinogenic to humans, and is associated with respiratory and cardiovascular diseases. Despite changes in diesel technology and stringent emission restrictions, high air concentrations of DE/DEP from heavy-duty diesel-powered equipment during tunnel finishing work in Norway are reported. Biological effects related to occupational exposure to DE in tunnel finishing workers are not known. Occupational exposure to DE following tunnel finishing work in Norway is associated with increased levels of bulky DNA adducts and deregulation of microRNAs in peripheral blood mononuclear cells, as well as altered plasma arachidonic acid and eicosanoid profiles. More attention should be directed towards clarifying biological effects of occupational exposure to DE, in particular in relation to tunnel finishing work. This study may have implications for risk assessment and preventive strategies concerning occupational exposure to DE. Occupational exposure to diesel exhaust (DE) is a great health concern,1 2 and is associated with respiratory and cardiovascular diseases (CVD).3 DE is classified as carcinogenic to humans,2 and this is supported by in vitro studies.4 5 Of particular concern is the use of heavy-duty diesel engines in enclosed environments such as underground mining and tunnel construction.1 Tunnel finishing workers (TFW) are fitters performing work related to, that is, electrical installation, rock support, and water and frost protection in road and railway tunnels. Despite reduction efforts, TFW are highly exposed to DE from heavy-duty diesel-powered equipment.6 Using elemental carbon (EC) as a marker of DE, the geometric mean (GM) EC concentration measured from personal full-shift air samplers obtained from three tunnels during finishing work was 37.8 µg/m3 (SD=2.7 µg/m3). GM level of NO2 was 128.0 µg/m3 (SD=2.9 µg/m3).6 The biological impact of working in such an environment is not clear. Epigenetic changes are strongly associated with environmental exposures and are mechanistically linked to adverse health effects.16 miRNA are single-stranded, short non-coding RNA sequences (~22 nucleotides) that post-transcriptionally can regulate gene expression. Deregulations of several miRNAs were identified from studies on exposure to DEP and air pollution.16 Altered expression of four miRNAs in PBMC after controlled short-term exposure of human participants to DE has been reported.17 In a study of foundry workers exposed to metal-rich particulate matter (PM), several miRNAs affecting candidate inflammatory genes were found to be deregulated.18 Little is known, however, about effects of occupational exposure to DE/DEP on miRNA expression, in particular regarding tunnel finishing work. Enzymatic and non-enzymatic oxidation of arachidonic acid (AA) and its precursor linoleic acid yields prostaglandins (PGs), hydroxyeicosatetraenoic acids (HETEs) and hydroxyoctadecadienoic acid (HODE) lipid mediators with implications for inflammation, CVD and carcinogenesis.7 19 20 Plasma lipid peroxidation products are suitable biomarkers of the biologically effective dose of PM and are shown to reflect oxidative stress in the airways.21 Increased levels of 8-iso-PGF2α, 12-HETE and 13-HODE were found in plasma from DE-exposed mice.7 A role for lipid peroxidation in mediating PM-induced atherosclerosis was reported in mice with increased plasma levels of 9-HODE and 12-HETE.22 Additionally, proinflammatory and cancer-promoting effects were reported for PGE2 and by contrast, PGD2 was identified as suppressor of cell invasion and generally was reported as antitumourigenic.19 Increased levels of 5-HETE, 12-HETE and 15-HETE are also linked to carcinogenesis and CVD.7 20 To our knowledge, however, effects on circulating AA and eicosanoids in human plasma following occupational exposure to DE/DEP have not been investigated. This study investigated the biological impact of DE/DEP exposure associated with tunnel finishing work. We aimed to identify effect biomarkers in PBMC and plasma from TFW compared with a referent group. Bulky DNA adducts and miRNA expression profiles in PBMC were measured by 32P-postlabelling and small RNA sequencing (sRNA-seq), respectively. Circulating free plasma AA and eicosanoids were analysed by liquid chromatography–tandem mass spectrometry (LC/MS/MS). Finally, expression of selected protein coding genes related to PAH-bioactivation and DNA adduct formation was explored by RT-qPCR. An occupational cross-sectional study was performed in Norwegian male TFW (n=69) and referents (n=69) working at the same/similar construction sites. In addition to a high level of exposure to DEP, some exposure to concrete dust may occur in TFW. Referents are administrative personnel, engineers, and outdoor road workers. Participants have mainly similar socioeconomic status. Referents may occasionally work inside tunnels for shorter time periods, and some exposure to asphalt and vehicle emission may occur. Generally, participants work for 11–12 days consecutively with 10–12 hours shifts, before a 9-day period off work. At the time of enrolment (2015–2016), the participants were employed by five different Norwegian companies working at eight construction sites in South Norway. Blood samples were collected from each participant on a single occasion at the construction sites in between shifts and each participant filled out a questionnaire. Background information collected included work operations, age, body mass index (BMI), smoking habits: never-smoker; former-smoker (less than a year); former-smoker (more than a year); daily-smoker; party-smoker, use of respirators (yes, often; yes, rarely; no), respiratory diseases (chronic bronchitis, chronic obstructive lung disease) and allergies. Blood was collected into EDTA tubes (BD Vacutainer K2E, Mediq Norge AS, Kløfta, Norway) and kept rotating EDTA blood was loaded onto a SepMate tube (StemCell Technologies, Cambridge, UK) preloaded with Ficoll (GE Healthcare, Oslo, Norway). Plasma was separated according to the manufacturer’s instructions and stored at ‒80°C. PBMC were treated with RBC lysis buffer and stored as pellets at ‒80°C. DNA was isolated from PBMC by standard phenol/chloroform extraction. The nuclease P1 enrichment version of the thin-layer chromatography 32P-postlabelling assay was used to determine bulky DNA adduct formation. The procedure was performed essentially as described,10 with minor modifications. All samples were analysed blind and in duplicate. An external benzo(a)pyrene-7,8-dihydrodiol-9,10-epoxide (BPDE)-modified DNA-standard was used as a positive control. Total DNA adduct levels were considered representative of PAH-DNA and other aromatic/hydrophobic adducts resistant to nuclease P1 digestion and measured in the diagonal radioactive zone. The method provides a summary measure of a complex mixture of adducts present in the postlabelling chromatograms. Results are expressed as adducts/108 nucleotides. Representative autoradiographic profiles of DNA adducts from never-smoking referents and TFW, daily-smoking TFW and an external BPDE-modified DNA-standard positive control are shown in online supplementary figure 1. RNA was isolated from PBMC using Trizol (Thermo Fisher Scientific, Oslo, Norway), dissolved in nuclease free water, and stored at ‒80°C. RNA-integrity number (RIN) was determined on an Agilent Bioanalyzer with RNA 6000 Nano kit (Agilent Technologies, Oslo, Norway). RIN values were in all cases ≥7.0. RNA was reverse transcribed with the qScript complimentary DNA (cDNA) synthesis kit (Quanta Biosciences, VWR International, Oslo, Norway). qPCR reactions were set up with PerfeCTa SYBR Green Fastmix (ROX) (Quanta Biosciences, VWR International). Relative gene expression was normalised to the expression of RNA18S and calculated using the ∆∆Ct method. Primers (online supplementary table 1) were purchased from Sigma-Aldrich or Thermo Fisher Scientific. Libraries for sRNA-seq were prepared using QIAseq miRNA Library kit (Qiagen, Hilden, Germany). Briefly, adapters were ligated to the 3' and 5' ends of miRNAs. sRNAs with ligated adapters underwent reverse transcription with unique molecular identifier (UMI) assignment followed by library amplification (16 cycles) on a Mastercycler Nexus (Eppendorf, Hamburg, Germany). sRNA libraries were validated on an Agilent 2100 Bioanalyzer (Agilent, Santa Clara, California, USA) using high-sensitivity DNA chips. Sequencing of sRNA libraries was performed on MiSeq system (Illumina, San Diego, California, USA) using MiSeq Reagent Kit V.3. Solid-phase extraction was used for AA metabolites (AA, PG, HETE, HODE, epoxyeicosatrienoic acids and leukotriene A4) from 0.5 mL human plasma samples. Analysis of plasma AA and eicosanoids by LC/MS/MS was performed as previously described.4 PGI2 was determined as its non-enzymatically hydrolysed product 6-keto-PGF1α. Data were analysed in StataSE V.14. DNA adduct measurements and gene expression data were log-transformed to normalise the distribution of the error terms and analysed by linear regression. Differential miRNA expression count data were generated by QIAseq miRNA Quantification, and the UMI counts were taken to compensate for sequencing bias. The DESeq2-package was used to test for differential expression by the application of negative binomial generalised linear models. Differential expression in experimental designs with two levels of a factor (TFW vs referents) was tested by Wald. A p<0.02 was used as cut-off for statistically significant deregulated miRNAs between TFW and referents. miRNA target genes and associated pathways were identified using DIANA mirPath V.3 and TarBase V.7.0 (accessed July 2018) with p<0.05 (Fisher’s exact test, false discovery rate (FDR) correction). Prior to analysis, some of the eicosanoid variables were transformed, using a square-root, log, or inverse transformation, to obtain a closer fit to the normal distribution for the residuals. Each variable was analysed by linear regression. Smoking was included in the analyses, while age and BMI were only added if p<0.1. Based on likelihood ratio tests, the residual variance was allowed to differ between referents and TFW for one outcome variable. TFW (n=69) and referents (n=69) participated in the study by giving one blood sample during a random workday in addition to filling out a questionnaire. All subjects were Caucasian men. Few workers reported wearing protective respirators or filtering half masks. Compared with referents, TFW were significantly younger and were more inclined to tobacco smoking (table 1). Other relevant parameters were not significantly different between TFW and referents. When stratified by smoking, significantly more DNA adducts were measured in PBMC from TFW compared with referents. 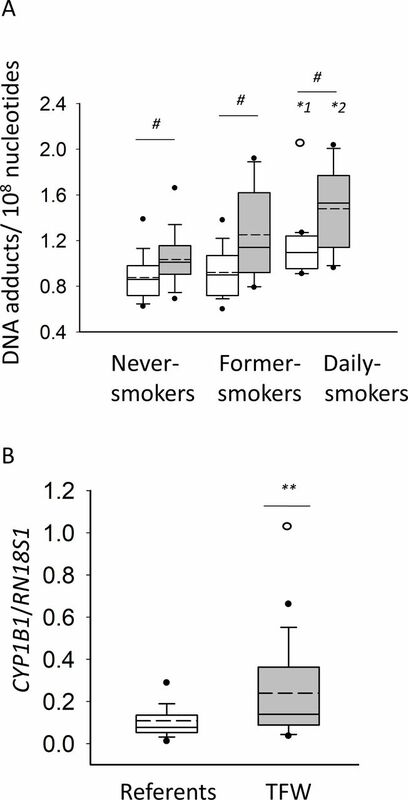 In the referent group, daily-smokers had significantly more DNA adducts compared with never-smokers. Equivalently, daily-smoking TFW had significantly more DNA adducts compared with never-smoking TFW (figure 1A). Bulky DNA adducts and CYP1B1 gene expression in PBMC from TFW and referents. (A) DNA adducts per 108 nucleotides in three smoking categories; never-smokers (n=27/17), former-smokers (n=19/16) and daily-smokers (n=7/21). (B) Gene expression of CYP1B1 in referents (n=36) and TFW (n=41). Box plots show 5th/95th percentile, median (solid line) and mean (dotted line). Referents are shown in white and TFW in grey boxes. Two extreme outliers marked with unfilled circles (one referent, daily-smoker (A) and one TFW, never-smoker (B) are excluded from the statistical analysis. P<0.05 (linear regression). *, significance between never-smokers and daily-smokers within the referents (*1) and the TFW group (*2), respectively. **, significance between referents and TFW. #, significance between referents and TFW within each smoking category. TFW, tunnel finishing worker. Expression of CYP1A1 and CYP1B1 was measured in PBMC from never-smoking and daily-smoking TFW and referents. Significantly higher expression of CYP1B1 was found among TFW compared with referents (figure 1B). Interestingly, there were no effect modifications by smoking. Expression of CYP1A1 was below the detection limit, and expressions of AHR and ARNT were not significantly different between the groups (data not shown). sRNA-seq was performed on samples from never-smoking TFW (n=14) and referents (n=13) matched by age and BMI. Seventeen miRNA (13(↓), 4(↑)) were identified as deregulated in TFW compared with referents (p<0.02) (table 2). Experimentally supported miRNA-gene interactions followed by pathway analysis were obtained for deregulated miRNAs (table 2) by DIANA mirPath and TarBase. Ten Kyoto Encyclopedia of Genes and Genomes (KEGG) pathways were significantly deregulated based on presumptive miRNA-gene target interactions (table 3). The pathways fatty acid biosynthesis and metabolism, steroid biosynthesis, proteoglycans in cancer and cell cycle may be of particular importance. Further information regarding miRNA-gene targets and their clustering are found in online supplementary table 2 and figure 2, respectively. Circulating free plasma AA and eicosanoids were measured in a subset of never-smoking and daily-smoking TFW and referents (table 4). Significantly more AA and 15-HETE, and significantly less PGD2 were found in TFW compared with referents. Compared with never-smoking referents, significantly less 9-HODE was measured in never-smoking TFW. Concentrations of all measured metabolites, although not significantly affected, are found in online supplementary table 3. Detailed exposure measurements of dust, EC, organic carbon, and NO2 have been reported from various job groups related to drilling and blasting during tunnel construction in Norway.23 However, DE/DEP exposure from heavy-duty diesel-powered equipment during tunnel finishing work was only recently investigated.6 Here, molecular alterations in PBMC and blood plasma coherent with working in such an environment were investigated. Results indicated increased levels of bulky DNA adducts and changes in miRNA profiles in PBMC, as well as altered free plasma AA and eicosanoid profiles in TFW. Stratified by smoking, significantly more DNA adducts were measured in PBMC from TFW compared with the referents. Similarly, more DNA adducts were measured in daily-smokers than never-smokers in both groups. It is established that smoking increases DNA adducts in PBMC.11 Here, results indicate that exposures encountered during present-day tunnel finishing work pose a further increased risk of developing DNA adducts in these cells. These findings are in line with previous studies investigating levels of DNA adducts in PBMC/WBC following exposure to DE,13 14 24 and positive correlations between cigarette smoking and DNA adducts in PBMC.11 Taking into account that DNA adducts in bronchial tissue may predict lung cancer risk,25 and that adducts in PBMC can be considered a distant surrogate of pulmonary exposure,11 this finding may have important implications for risk assessment and preventive strategies concerning the group of TFW. Levels of DNA adducts are dependent on the individual’s xenobiotic metabolising capability. Significantly higher levels of CYP1B1 expression were measured in PBMC from TFW compared with referents. Interestingly, CYP1B1 expression was not influenced by smoking and CYP1A1 expression in PBMC was below the detection limit in agreement with a previous report.26 AHR and ARNT were equally expressed in both groups. A crosstalk between the oestrogen receptor (ER) and the AHR pathway exists.27 Several PAHs present in DEP are shown to directly activate ERα,27 indicating that CYP1B1 may be induced by non-AHR-mediated mechanisms. Alternatively, endogenous availability of coactivators may play a role.27 Nonetheless, results suggest that CYP1B1, rather than CYP1A1 may have implications for DEP-induced DNA adduct formation in PBMC. The remaining deregulated miRNAs have not been studied in relation to DE/DEP exposure. Some are associated with lung and colorectal cancers and as possible prognostic markers (miR-20b-5p, miR-196b-5p, miR-4500 and miR-340),30–32 while others may have roles in Alzheimer’s disease, chronic heart failure, and cell migration and invasion (miR-6513–3 p and miR-660–3 p).16 33 Both miR-20b-5p and miR-196b-5p may be important regulator of apoptosis and tumourigenesis.32 Whether these miRNAs are related to adverse health effects of DE/DEP exposure is not known. Pathway union analysis based on putative miRNA-gene targets revealed potential deregulation of several fatty acid related KEGG pathways in TFW, in addition to cell cycle, steroid biosynthesis, and proteoglycans in cancer. Exposure to air pollution is significantly associated with increased risk of type 2 diabetes mellitus.34 Subchronic exposure to low concentrations of DE is shown to deregulate genes related to fatty acid biosynthesis in mice.35 miRNAs may regulate cell cycle progression,36 and altered expression of cell cycle-related genes has been reported after exposure to organic components from DEP.37 Steroid biosynthesis is a target for endocrine disrupting chemicals, including PAHs.27 Interestingly, human bronchial epithelial cells exposed to DEP in vitro also showed deregulation of this pathway.4 Deregulation of proteoglycans in cancer may be of importance as this pathway of extracellular matrix constituents is emerging as highly affecting homoeostasis and progression of various diseases, including cancer.38 Combined, results indicate potential mechanisms for associations between miRNA-regulated pathways, increased levels of DNA adducts and altered plasma AA and eicosanoid profiles in TFW. Deregulated pathways may affect lung homoeostasis, carcinogenesis, inflammation status, and the cardiovascular system. Further research is needed to identify specific mechanisms behind deregulated miRNAs and associated pathways following occupational exposure to DE/DEP. Little is known about free plasma AA and associated eicosanoids in response to DE/DEP exposure in vivo. In line with present findings, increased levels of plasma 15-HETE were found in PM-exposed mice.39 15-HETE signalling is associated with cardiovascular pathogenesis, as well as cancer development.20 While we report reduced levels of PGD2 in TFW, an increase in this metabolite was measured in plasma from PM-exposed mice.39 Interestingly, the great majority of studies indicate antitumourigenic activities of PGD2.19 Levels of 9-HODE was lower in never-smoking TFW compared with never-smoking referents, suggesting the involvement of antioxidant responses. Increased level of this metabolite has been measured in PM-exposed mice,22 but the modulation of oxidative stress and antioxidant defence processes may be time and dose dependent. Evidence indicates that gaseous NO2 is an independent risk factor for CVD.9 Since NO2, together with DEP and other DE constituents, can induce oxidative stress and inflammation,3 5 7 8 it may be speculated that NO2 participates in AA and eicosanoid deregulation. Combined, present results suggest that in particular increased concentrations of AA and 15-HETE, and decreased levels of PGD2 and 9-HODE may represent biomarkers of exposure to DE/DEP. These analytes make up a complex network with the potential to modulate inflammation, cell growth responses and the cardiovascular system, but more research is needed to elucidate in detail their biological effects. Possible confounding due to the healthy worker effect is of general concern. Here, all participants were employed at the time of enrolment. Women were excluded because of low number of potential participants. The cross-sectional study design combined with the one blood sample obtained from each participant could have led to incidental results. However, grouping TFW and referents without major stratification limits the potential influence by such bias. The referents constitute a more heterogeneous group than the TFW and they may occasionally spend short time periods within tunnels. Combined, one could speculate that differences between TFW and referents may potentially be more pronounced than the current results indicate. In conclusion, exposure to DE/DEP during tunnel finishing work is associated with biological alterations in TFW. This group of workers has been little studied regarding potential work-related adverse health effects. More attention should be directed towards describing biological effects and possible implications on health outcomes from occupational exposure to DE/DEP and, in particular, related to tunnel finishing work. We thank Rita Bæra for skillful technical assistance. We also thank the workers and the tunnel construction companies participating in this study, in particular Kristin H Hovland (Occupational Health Physician). International Agency for Research on Cancer. Diesel and gasoline engine exhaust and some nitroarenes: IARC Monographs on the evaluation of carcinogenic risks to humans, 2014:105.
. Kartlegging av eksponering for dieseleksosartikler i norsk arbeidsliv ved bruk av elementært karbon som markør. STAMI-report 2015.
. Correlation of DNA adducts in blood mononuclear cells with tobacco carcinogen-induced damage in human lung. Cancer Res 1995;55:4910–4.
. Effect of environmental air pollution on type 2 diabetes mellitus. Eur Rev Med Pharmacol Sci 2015;19:123–8. HEI Diesel Epidemiology Panel. Diesel emissions and lung cancer: an evaluation of recent epidemiological evidence for quantitative risk assessment. 2015:19. Contributors Study design was led by IR and SM, with contributions from BU, PR, VMA, DHP, MM, JT and AH. IR, EP and BU carried out enrolment of participants and collection of human samples. Data collection was carried out by IR, VMA, KV, JN and PR. IR, ØS and JK conducted statistical analyses. IR drafted the manuscript. All authors participated in data analysis, critically revised the manuscript and approved the final version. Funding This work was financially supported by the Statoil Working Environment Fund (Norway) and the Ministry of Youth, Education and Sports of the Czech Republic (LO1508 to PR, JK and KV, LM2015073; CZ.02.1.01/0.0/0.0/16_013/0001821 to JT; the grant Research Center for Informatics CZ.02.1.01/0.0/0.0/16_019/0000765 to JK; project "FIT", no. CZ.02.1.01/0.0/0.0/15_003/0000495 to MM and JN). Work at King’s College London was supported by the National Institute for Health Research Health Protection Research Unit (NIHR HPRU) in Health Impact of Environmental Hazards at King’s College London in partnership with Public Health England and Imperial College London. Disclaimer The views expressed in this article are those of the authors and not necessarily those of the UK National Health Service, the UK National Institute for Health Research Health, the UK Department of Health and Social Care or Public Heath England. Ethics approval The study was approved by the Norwegian Regional Committees for Medical and Health Research Ethics (REC #2014/2199).